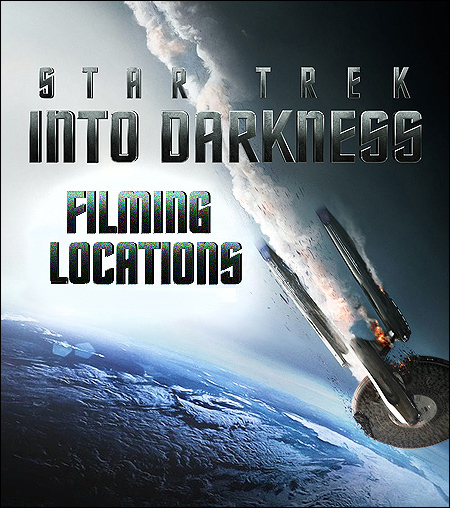 "Star Trek: Into Darkness" was filmed. dangers of taking the torpedoes onboard, and then resigns in protest when his warnings go unheeded. This is the only major location that isn't in the Greater Los Angeles area. at 7000 East Ave, in Livermore, California. hundreds of millions of degrees and pressures of hundreds of billions of atmospheres. 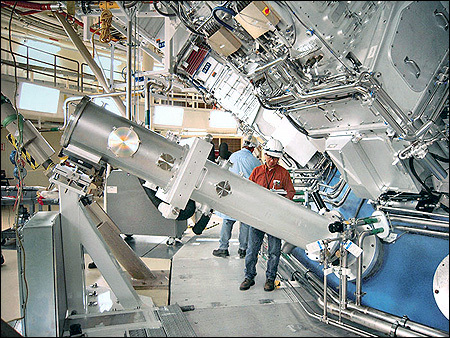 Livermore is about 300 miles north of Los Angeles, and 50 miles west of San Francisco. that isn't supposed to be in San Francisco - it's supposed to be out in space, aboard the Enterprise. Here's a Google StreetView of one of the entrance roads to the facility. where Spock rushes to the dying Kirk. control, Kirk & Scotty fall & dangle here, but are caught & rescued by Chekov. This scene was shot inside the Budweiser Brewery, at 15800 Roscoe Blvd, in Van Nuys, CA. is just west of the San Diego (405) Freeway. featured lush gardens, a monorail, boat rides, bumper cars, lagoons and waterfalls. That theme park operated from 1966 until 1979 - when they went back to being just a brewery. (Here is a Google StreetView of the brewery. a brief shot of Star Fleet cadets watching the disaster from a distance. the fake background of the San Francisco bay (and, of course, the starship). One was in downtown Los Angeles and the other was in Century City. 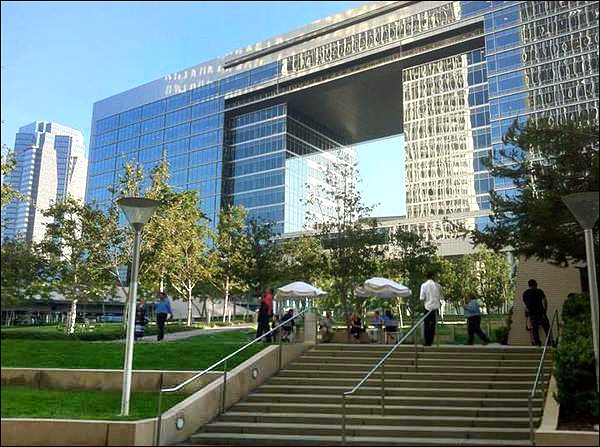 California Plaza and the Wells Fargo Center sit across from each other. between the CAA building and the landmark Century City twin towers. end and the CGI fakery begins. 1:52:52: Kahn's ship crashes into the city. the Century City twin towers and the Creative Artists Agency building, at 2000 Avenue of the Stars. 1:54:19: Khan survives the crash & flees through the panic. 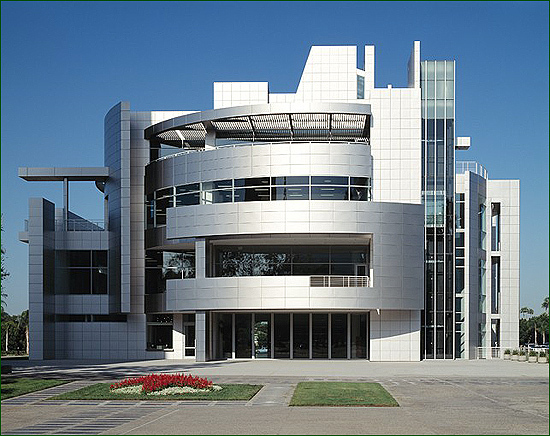 Creative Artists Agency building, at 2000 Avenue of the Stars. Everything else, such as the collapsing buildings, is CGI. 1:54:32: Spock beams down and chases Khan. In the photo above, they are still on the plaza behind (east of) the CAA building. Here is a Google StreetView panorama of those twin towers. 1:54:45: Khan runs into a glass building (followed by Spock in pursuit), then crashes out through the glass doors. and the action suddenly shifts from Century City to Downtown Los Angeles, a good 10 miles away. of the two brown skyscrapers that make up the Wells Fargo Center. Behind Khan's head is the 54-story Wells Fargo Tower, at 333 S. Grand Ave.
from the crosswalk at 450 S. Grand Avenue. The Wells Fargo Center is on the right (west). 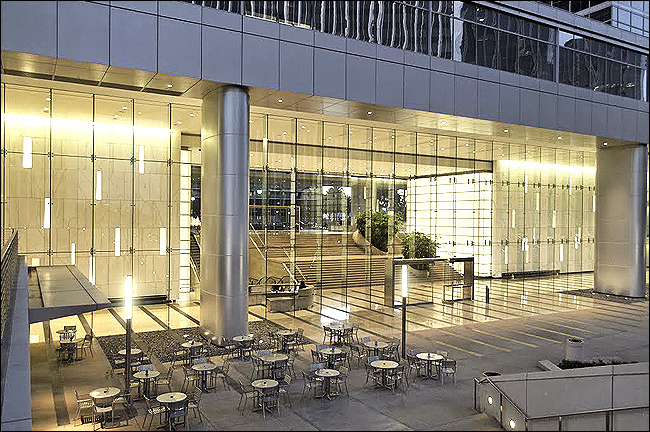 windows is the base of the Two California Plaza tower, a 52-story skyscraper at 350 S. Grand Avenue. [ After they reach the other side of the street, Khan leaps aboard a red, flying transport. designed to rechristen the Enterprise and honor those who died in the crash. filled with dress-uniformed Star Fleet officers. The building behind Kirk looks a lot like The Getty Center - but it's not. which may well have influenced the decision to use it in the film. Crystal Cathedral, at 12141 Lewis Street, in Garden Grove, CA. Welcoming Center, located about 80 yards west of the Cathedral. very identifiable in the closer shots, such as the photo above. The camera is looking west in the photo above. (Here is a Google StreetView of the Cathedral. The photos on this page are stills from "Star Trek: Into Darkness"